My undying love for the Christmas season will forever be one of life’s unsolved mysteries. For someone who considers herself nonreligious and nontraditional, it’s downright remarkable how devoted I am to this holiday. No matter where I am, I’ll always spend these 4-5 weeks of the year listening to Mariah Carey and NSYNC Christmas songs, drinking spiced cider and mulled wine, and watching Love Actually and Home Alone 2. It just never gets old. BUT – I’m in New York City. Clearly there’s more to the Christmas season than watching movies and drinking. And with 5 (soon to be 6) holiday seasons under my belt here, I feel like I’ve got reasonable authority on what to do in New York for the holidays. 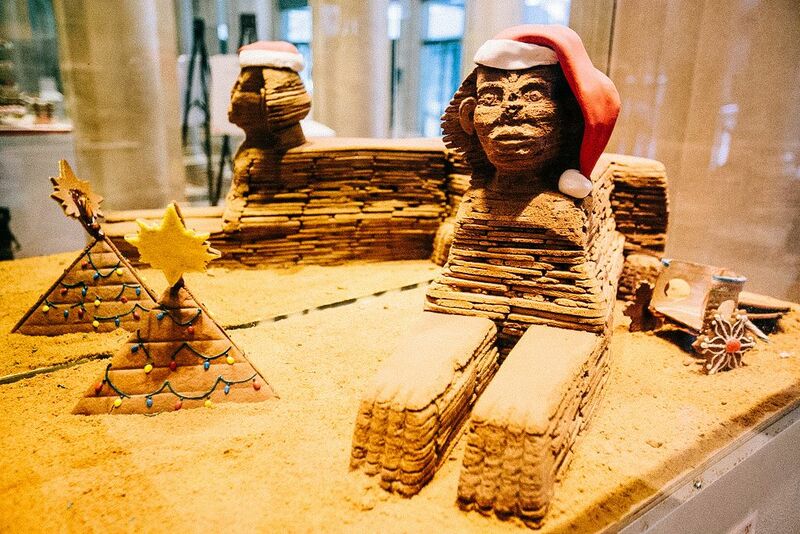 Much like everything else in New York, you can go all out and splurge on your Christmas experience here, or you can do more offbeat Christmas activities without spending much (if anything) at all. 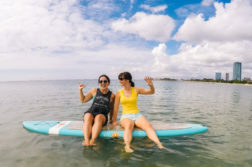 If Option 1 is your jam, then great – come to New York for the day (or weekend), see the Rockettes, take a carriage ride around Central Park, shop til you drop on 5th Ave, grab a $10 hot chocolate at Serendipity because Oprah said so, and eat a fancy dinner somewhere in Midtown. 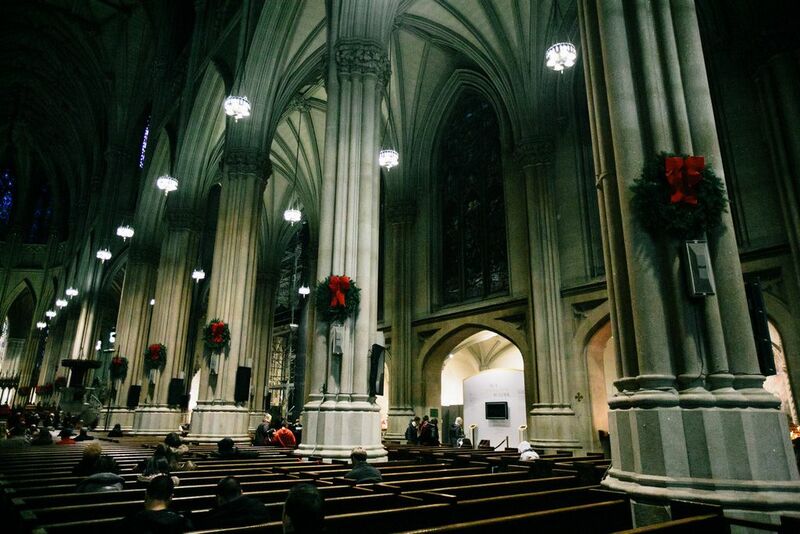 No judgment here – this was what Christmas in NYC was to me before I moved here, and it’s a fun time. But as a New Yorker and a frugal frolicker, my New York Christmas looks a lot different these days. 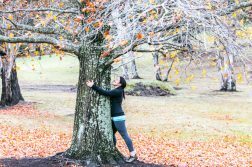 My December is always filled with affordable offbeat holiday activities; each year I add more to my ever-growing list, which I’ve finally decided to put on (virtual) paper for others to enjoy as well! 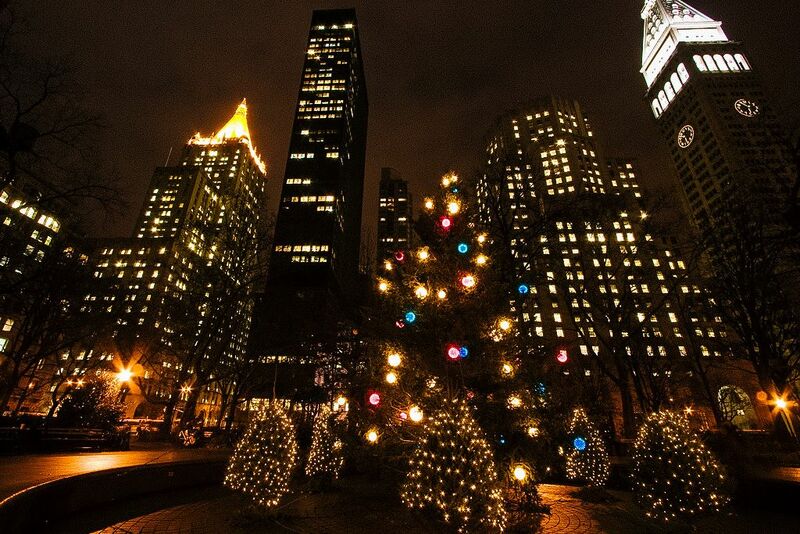 With that, I present you with The Definitive Guide to Christmas in New York City! 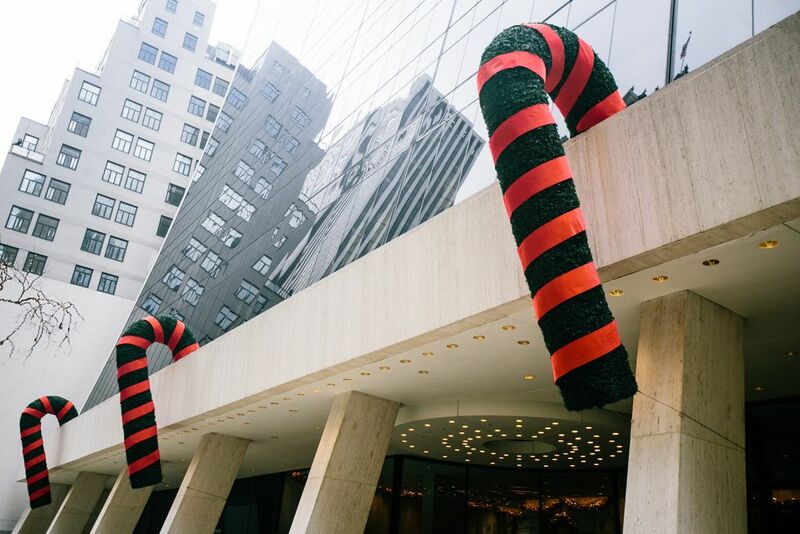 In 5 years worth of thorough Christmas season wanderings in NYC, I’ve checked out all sorts of holiday displays around the city – many of which I never would have known existed had I not done my research and intentionally sought them out. Involving much frolicking and zero spending, wandering around to check out the myriad Christmas decorations in NYC is a frugal frolicker’s delight. Nostalgia Train – The M line runs old trains from the 1930-70’s on the first 4 Sundays in December. You can catch this vintage subway from 10am-5pm (as I accidentally did last year). The Rockefeller Center tree lighting is far and away the most famous lighting ceremony in New York – and the most crowded. Complete with musical performances and a live broadcast, it’s a pretty big deal. All over the country, regional groups of tuba players assemble annually to perform holiday music. Nothing but tubas; nothing but Christmas tunes. Maybe it’s the band geek in me, but Tuba Christmas never fails to give me goosebumps. Tuba Christmas is fast becoming my favorite Christmas activity in the city. Being smack in the middle of the Rockefeller Center skating rink, it’s got that distinct New York feel to it; and while there will be plenty of spectators, it’s hardly crowded by New York standards. Most people who are there to watch are either the families of the performers, or just random passers-by who happened to be in the right place at the right time. Or maybe they’re like me and intentionally sought out the event out of pure love for tubas and/or Christmas. Regardless, it’s not a touristy event, which I think makes it feel more special. 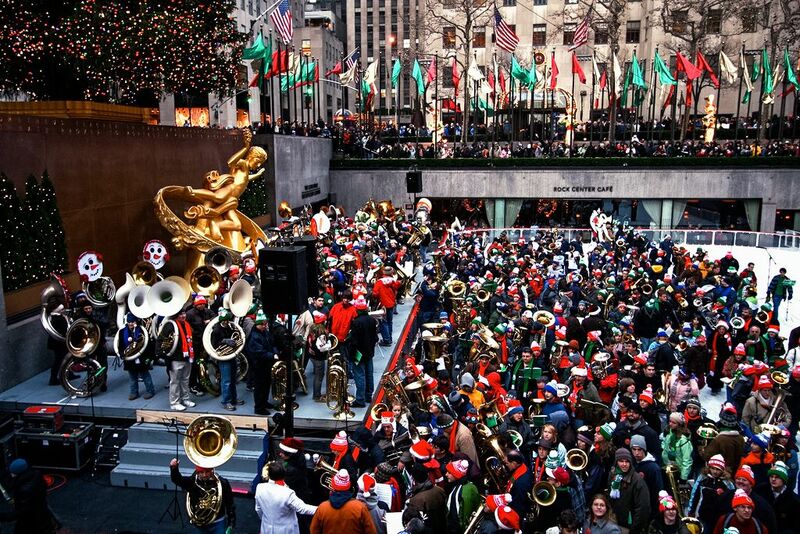 NYC’s Tuba Christmas is typically on a Sunday afternoon in mid-December. Picture hundreds (thousands?) of loonies dressed as some variation of Santa or other associated characters, descending on New York City at the same time. This is SantaCon. There is no set route map; there are no rules. There is, however, plenty of drinking and other shenanigans. While the vast majority of SantaConners are some variation of Santa or elf, I’ve also seen people dressed as wrapped presents, polar bears, and Christmas trees. It’s so much fun to see how creative people get with their costumes! For those who want to properly do SantaCon, the starting location is announced the night before. You can follow the official twitter handle or the website, where each meetup location is announced in real time, and then make your way from spot-to-spot with hoards of other Santas. 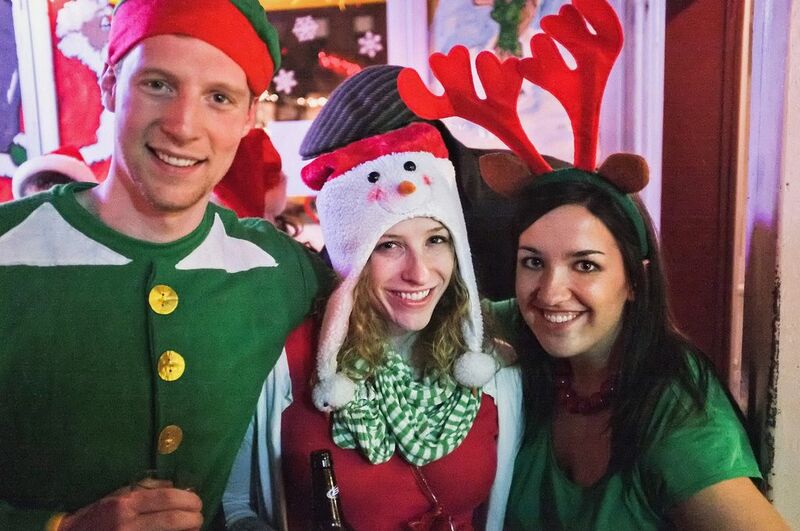 SantaCon is very deliberate in not wanting to be called a bar crawl, though most of the meetup locations are in fact at bars; either way, Santas will be drinking all day, whether in bars or by flask. For those who would rather do their own thing, you’re pretty much guaranteed to bump into the madness at some point. While SantaCon may make its way through any of the 5 boroughs, in the last 5 years I have ALWAYS seen it go through both Manhattan and Brooklyn. Best bet for wanting to run into the Santa crowd would be to hang out south of Union Square, around the East or West Village. SantaCon takes place on a Saturday in mid-December, starting at 10am. 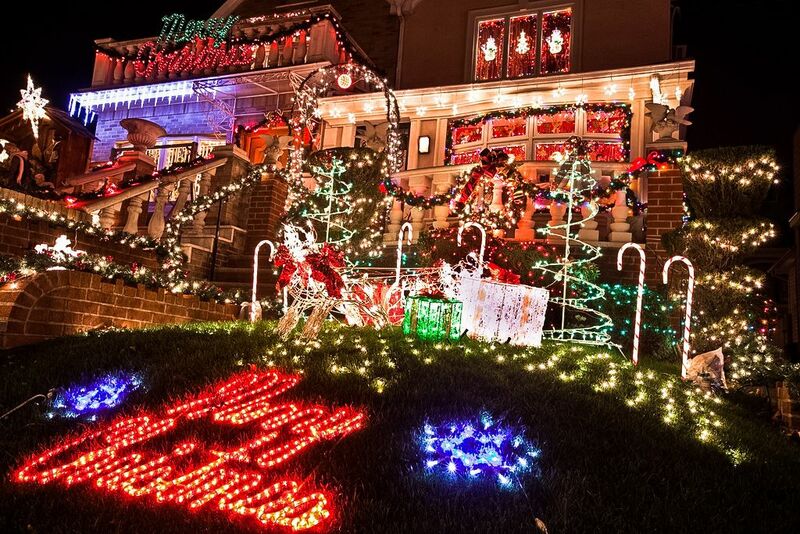 Behold, my best-kept holiday secret: the magnificent display of Christmas lights in Dyker Heights. Fortunately, I don’t think I have to worry about it becoming too popular, as this neighborhood is located pretty deep into Brooklyn and well off the tourist trail. Take the subway to southern Brooklyn and you’re transported to land where nice houses with yards and garages exist – in New York City! I think it must be an unspoken rule where if you live in this part of Dyker Heights, you’re obligated to deck your house and yard out with Christmas lights each year. It’s literally house after house of extravagant light displays, inflatable characters, and Christmas music. Many of the displays are professionally done; all are silently competing with each other. The best way to do the Dyker Heights Christmas lights is to hop on the train with some friends and a thermos of hot cider and make a night of it. Take the D or M train to 79th St or the R to 86th St and tour the area on foot. 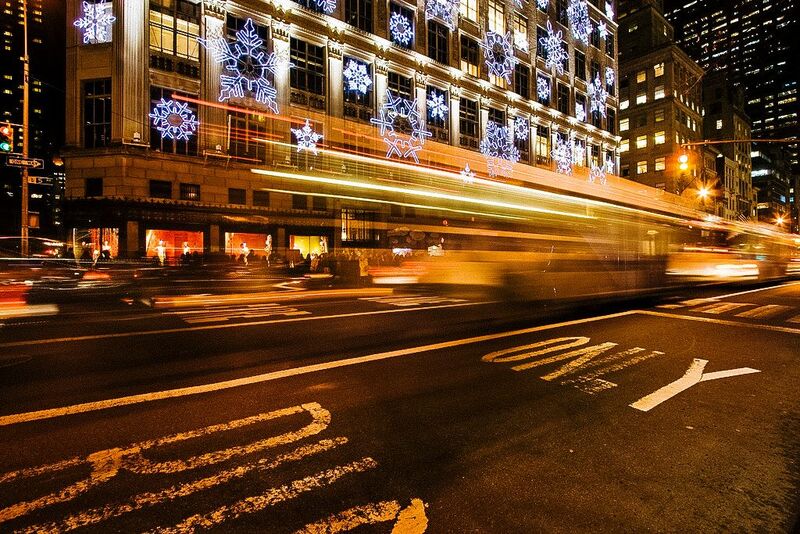 Most of the lights are between 83-86th St and 11-13th Ave. Best of all: it’s FREE! 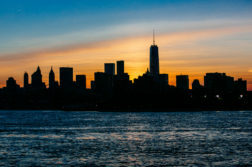 Admittedly I’m not much of a shopper, and my Christmas gifts are usually handmade or purchased during my travels – but if I were, I would totally hit up the seasonal markets over retail chains in New York City. They’re comprised of vendors selling unique handmade crafts such as jewelry, winter accessories, soaps, and stationary. 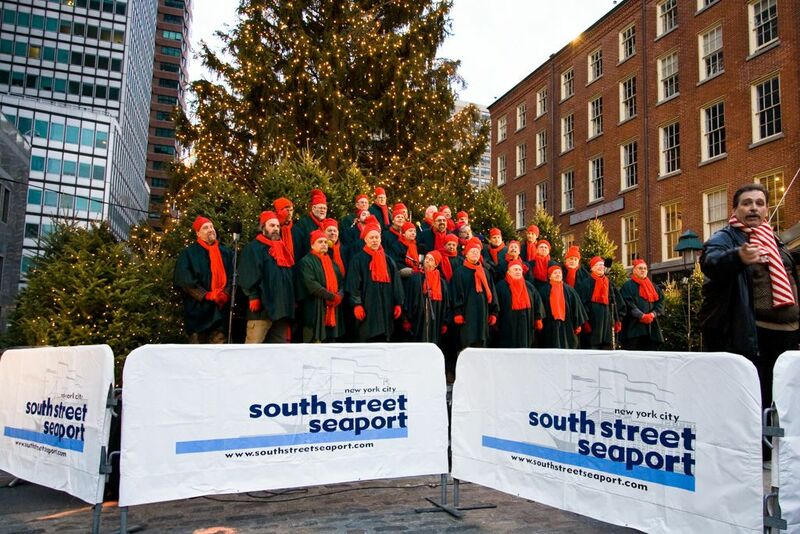 Union Square Holiday Market – Daily, 11am-8pm(ish). 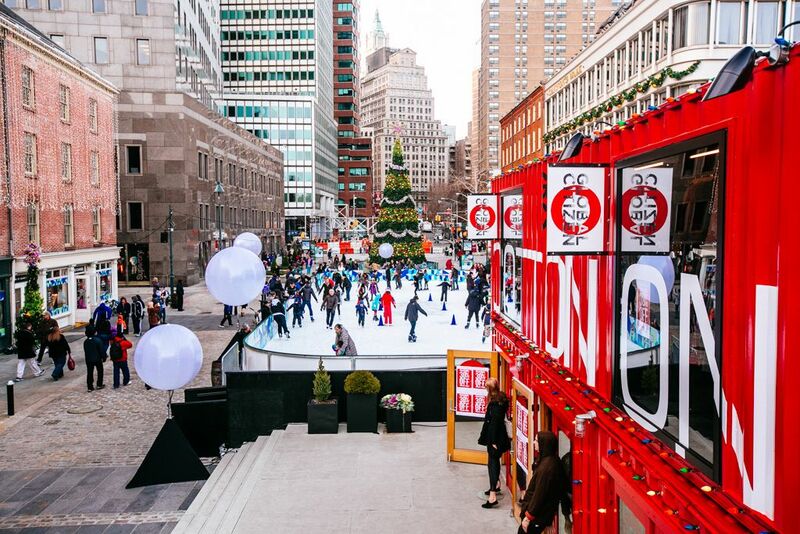 Bryant Park Holiday Shops – Daily, 11am-8pm(ish). 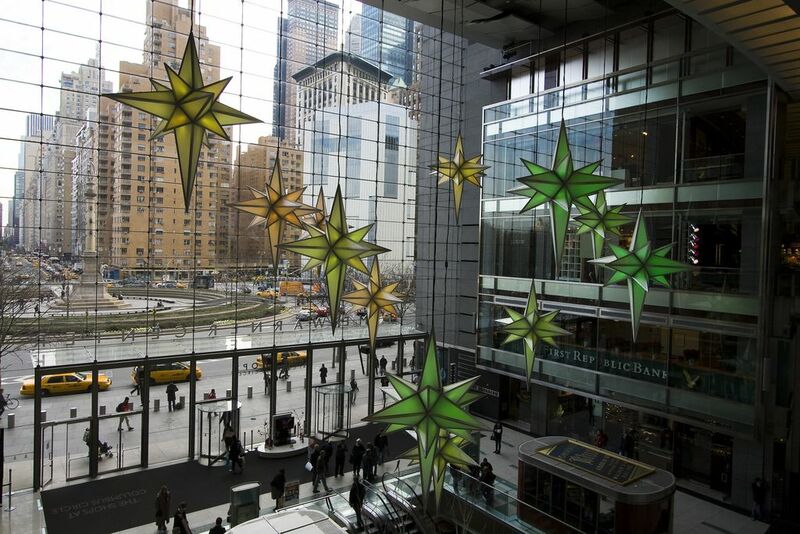 Grand Central Holiday Fair – Daily, 10am-8pm(ish). Columbus Circle Holiday Market – at the southwest corner of Central Park. Daily, 10am-8pm(ish). Artists & Fleas – A pop-up version of the Williamsburg Artists & Fleas. Daily, 10am-7pm at Chelsea Market. Brooklyn Night Bazaar – Saturday nights in Greenpoint, Brooklyn. 6pm-12am. 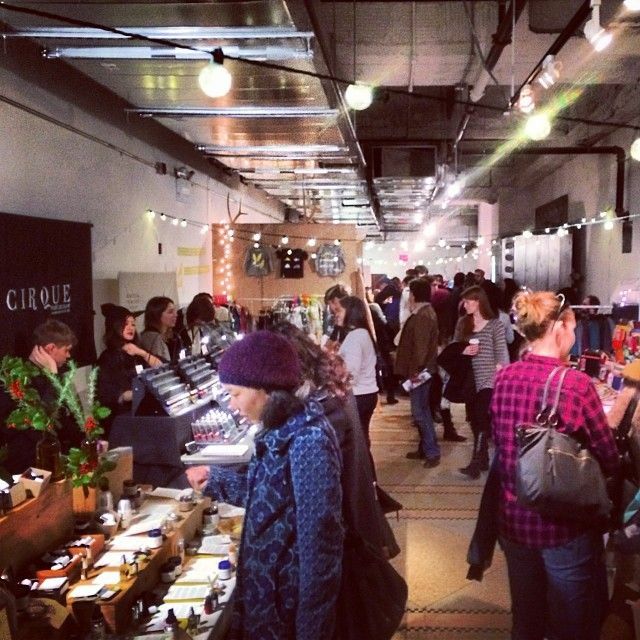 Williamsburg Winter Flea – Smorgasburg and Brooklyn Flea combine to make one winter market. Saturday and Sunday, 10am-7pm, in Williamsburg, Brooklyn. Through March. There are a handful of other markets that are open for just one weekend during the season. I always like checking these out because they often have different items than the regularly-operating markets. Unfortunately, the price tags tend to match the level of uniqueness offered, so it’s best to walk in with a finite amount of cash and no cards on you. Trust me on this! Renegade Craft Fair – Brooklyn. Dec 16-17, 2017 at Industry City. I used to love this fair when it was held in the summer in Williamsburg, but crowds and prices have inflated in recent years. Bust Craftacular – Greenpoint, Brooklyn. Dec 9-10, 2017. I rather like this one, but I don’t think I’ve ever bought anything from it. Degenerate Craft Fair – Chinatown. Not scheduled for 2017. Pegged as the “anti-craft fair”, I’m eager to check this one out for the first time! It’s to be expected that one who hates the cold and has poor balance would not take to ice skating, so I do not speak with authority when it comes to ice skating in New York. I haven’t stepped foot on a rink since one of our last family outings to NYC ~10 years ago, where my sisters and I skated at Wollman Rink in Central Park (you know, the one from Home Alone 2). I remember I was triumphantly about to complete one crawling lap around the rink when some jerk crashed into me and knocked me down. I took that as a sign that I was right to stay off skates and haven’t skated since. But ice skating is gaining popularity here, with a few new rinks popping up just this year (i.e. the second half of the list below). If you want to shell out a small fortune and wrestle the crowds of tourists at the Rockefeller and Wollman rinks, you can have your quintessential *Ice Skating in NYC* experience; but if you’re just looking to skate without the glitz and hype, there are plenty of other less-popular and more affordable rinks . 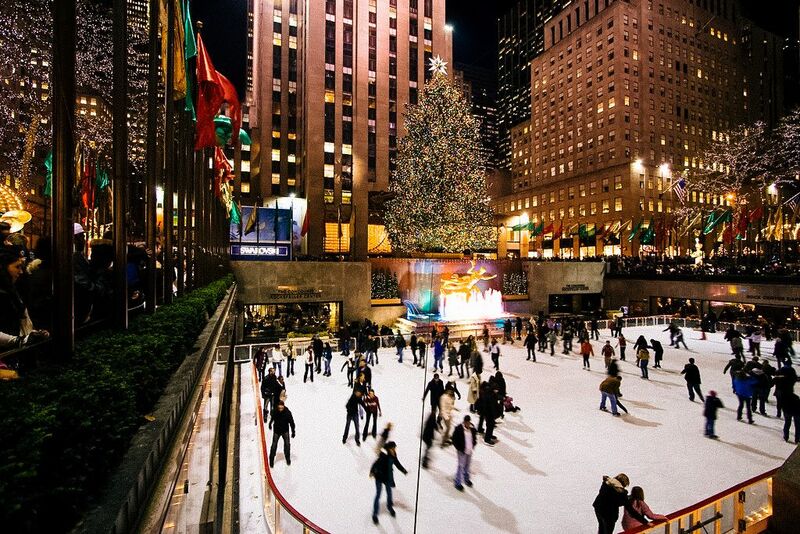 Any other New York Christmas attractions to add to this list?